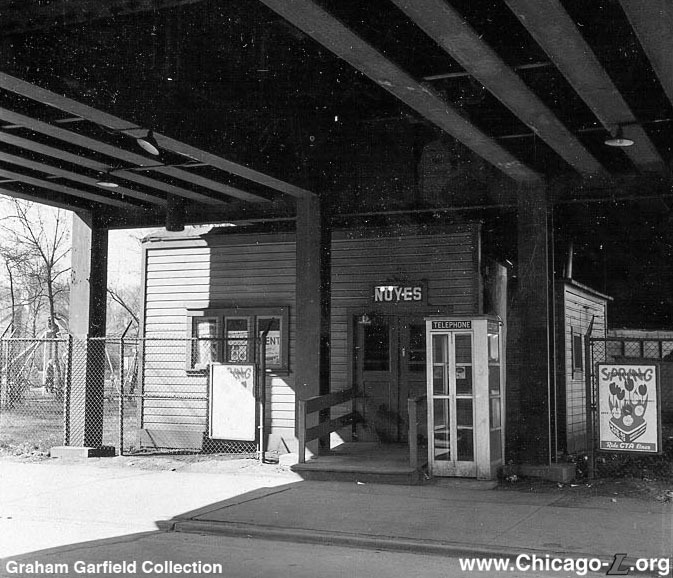 The St. Paul had a station at Noyes Avenue, of a style typical of railroad depots. 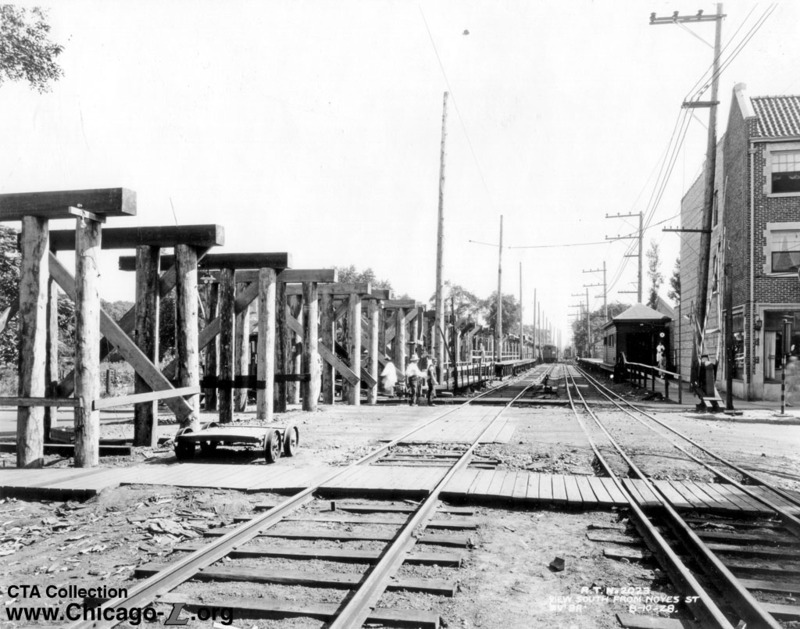 As they did at the other stations on the newly electrified line, the Northwestern Elevated Railroad chose not to use the station facilities of the St. Paul steam railroad, which were situated and designed for the needs of a main line commuter railroad rather than a rapid transit service. 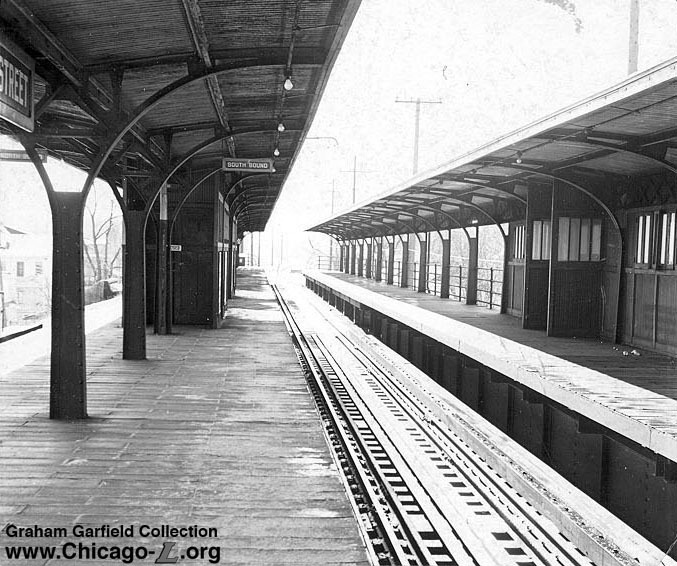 Instead, the Northwestern built a new station at the same location as the St. Paul's station. 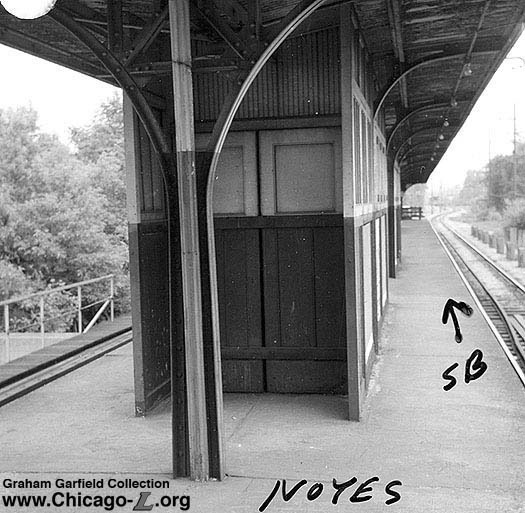 The "L" station facility at Noyes was a simple ground-level station and modest platform. The station house was a small, wood frame building set between the two tracks at ground level with a wooden walkway and stairs leading up to it from the street. The exterior used clapboard siding and a hipped roof with eaves. The rear opened out onto an island platform. The platform had a short canopy with a hipped roof (which was actually a continuation of the station house's roof) and center wooden columns with angled brackets, and wood decking. 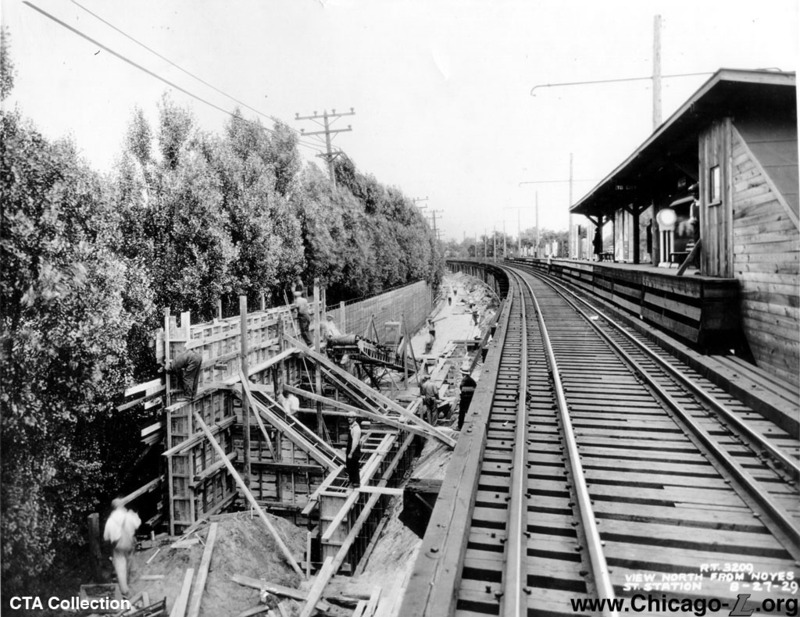 Foster and Noyes stations were rebuilt in 1931 at the same time as Central, when the line was elevated through north Evanston. 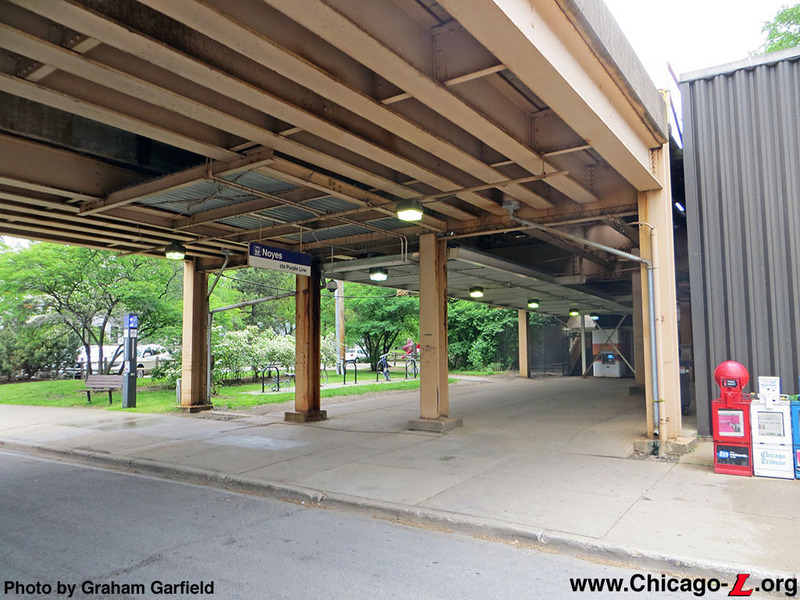 There were Beaux Arts station houses that were similar to Central's designed for Noyes and Foster by Chicago Rapid Transit Company architect Arthur Gerber, but they were never built. 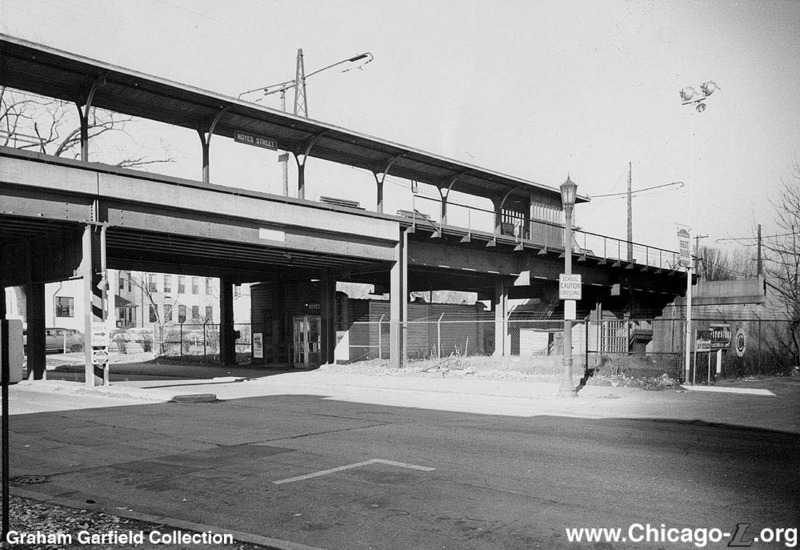 Instead, there were "temporary" wooden station houses below the tracks at Noyes and Foster on the present sites of the walkways from the street to the stairs up to the platforms, across from where the permanent station houses would've been. These temporary station houses were removed in 1964, when the fare controls were moved up to platform level. 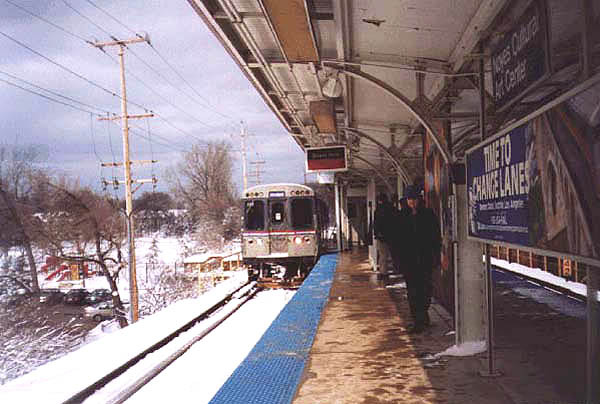 The station originally had two platforms, one island between the two tracks and an additional side platform to the west of the inbound track. 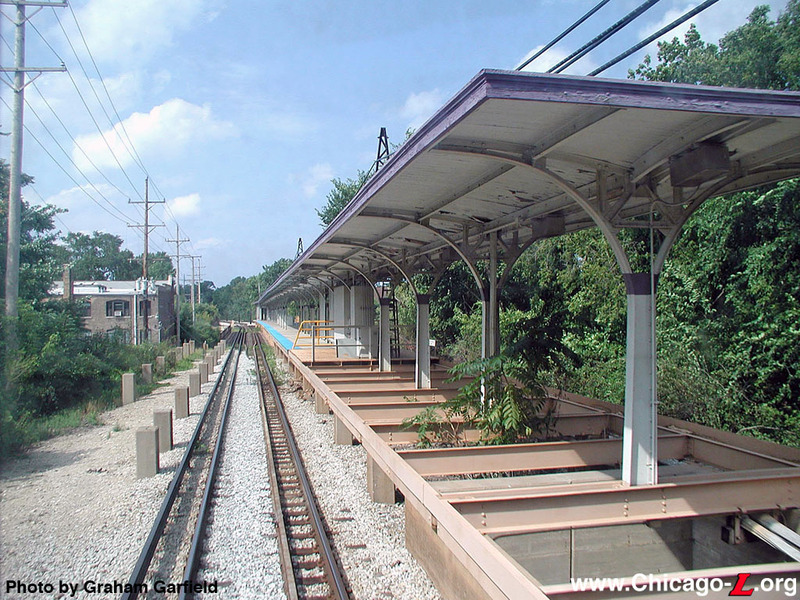 The island platform was for the "L" and northbound passengers of the North Shore Line, a interurban that entered Chicago via trackage rights on the Evanston and North Side "L" lines, while the side platform was for southbound North Shore Line riders. 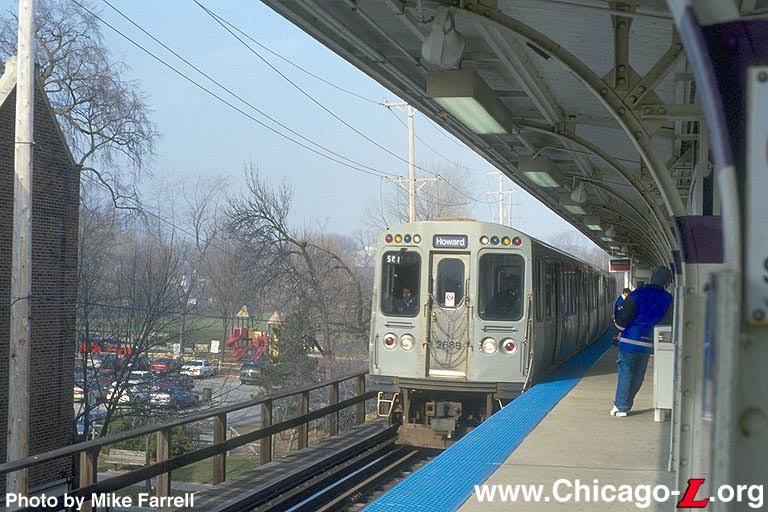 The idea was to separate inbound interurban passengers so that they couldn't transfer to local "L" trains for free. 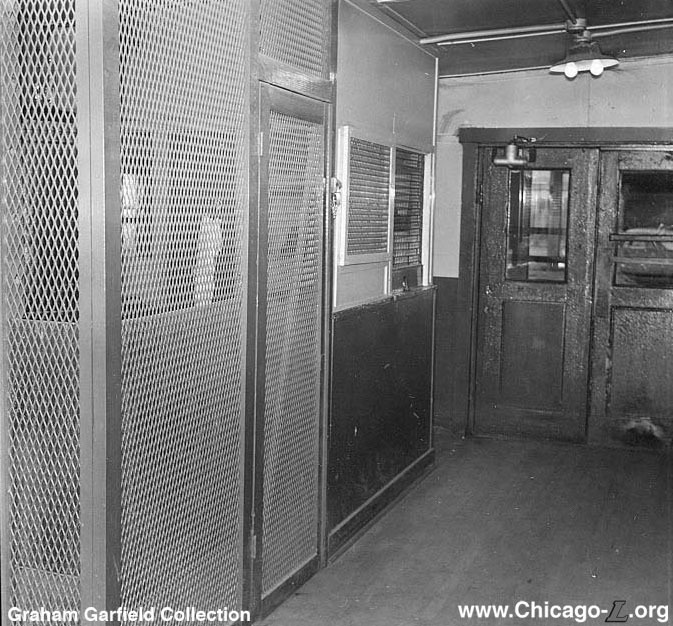 There were no such concerns about "L" passengers boarding northbound North Shore Line trains, as the interurban had conductors that would check for tickets. 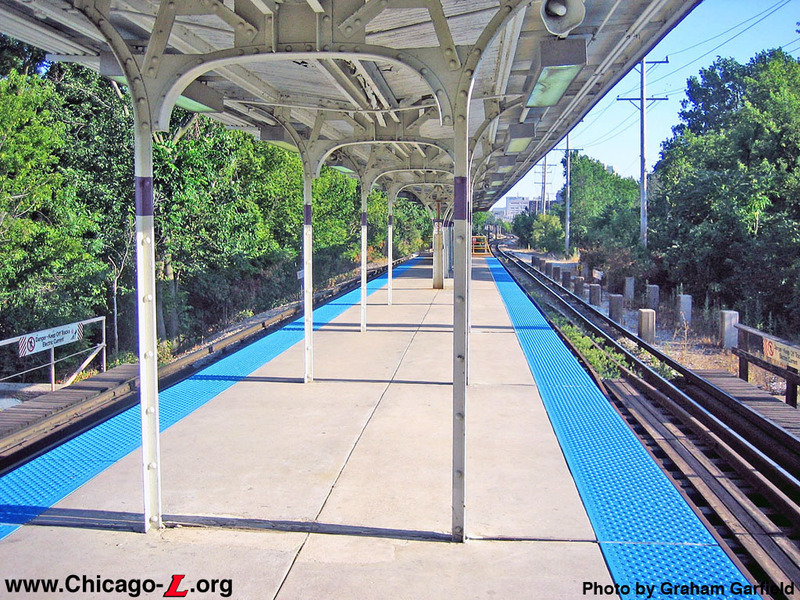 The platforms were originally decked with Haydite concrete slabs covered with 1"-thick asphalt planks. The island platform's steel canopy supports ran down the center line and split into gently-curving gull wing-shaped roof supports, supporting a wooden canopy roof. The side platform was similarly designed, except that the supports lined the back of the platform and simply arched out over the platform. The stairs were sheltered by wooden enclosures with swinging doors at the front of each enclosure. The disused North Shore Line platforms at Foster, Noyes, and Central, which were abandoned when operation via the interurban's the Shore Line Route was discontinued in 1955, were not removed until 1970, although their concrete footings are still evident. 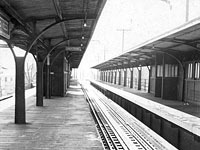 The island platform is still in use by "L" trains, though its asphalt flooring was later replaced with a concrete deck. On July 16, 1964, the fare controls at Noyes were relocated to the far north end of the platform. 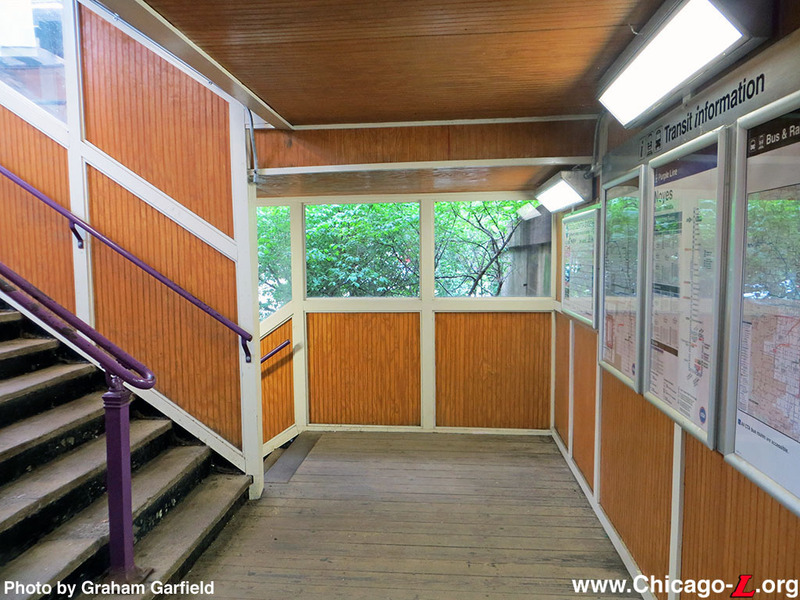 The street-level wooden station house, which had been meant to be temporary (but lasted over 30 years) was demolished, and a single-agent booth was erected at the top of the stairs from street level. 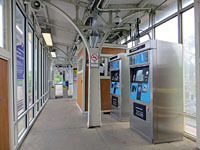 The width of the platform allowed for two lanes of passenger traffic, with the one farthest from the booth intended for exiting passengers and regulated by a one-way turnstile. The lane passing in front of the booth had no turnstile, with one not installed for many years. 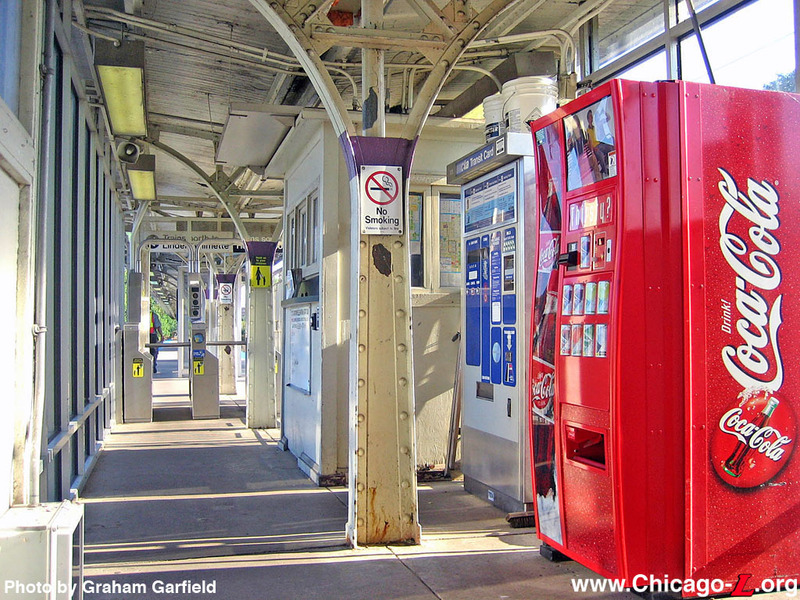 On March 29, 1996, the northbound berth markers at Noyes station relocated to allow installation of Automatic Fare Control (AFC) equipment -- farecard vending machines and two turnstiles. 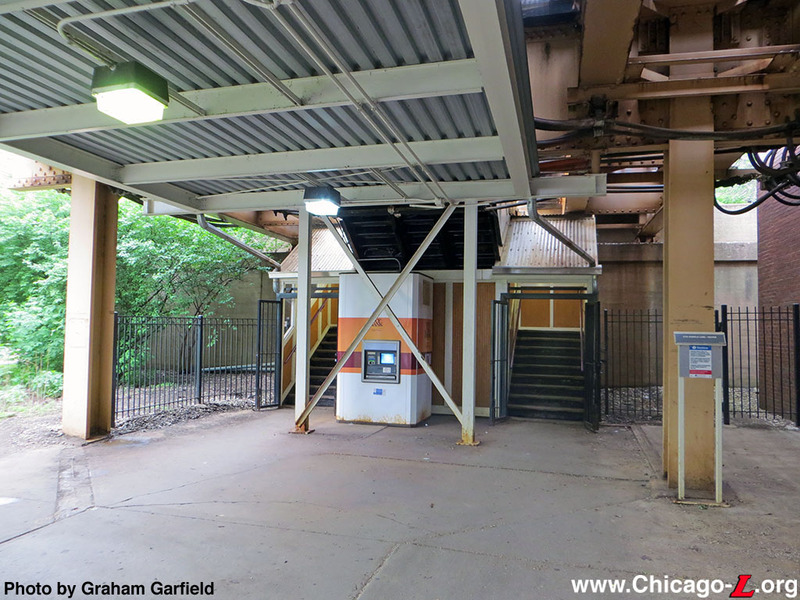 Because the AFC turnstiles were wider than the ones they replaced, they had to be placed south of the agent's booth, encroaching further onto the platform and requiring train berthing to be moved farther south. 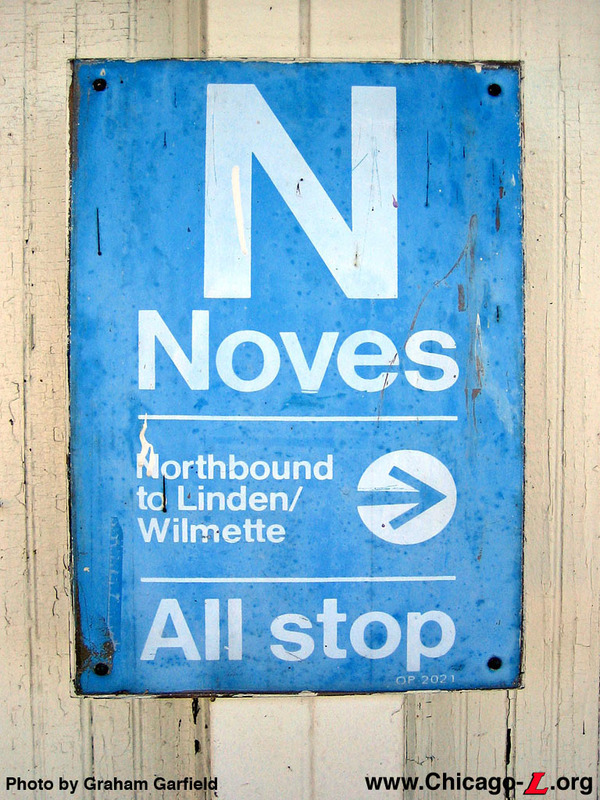 During spring 2004, Noyes began receiving new platform signage. 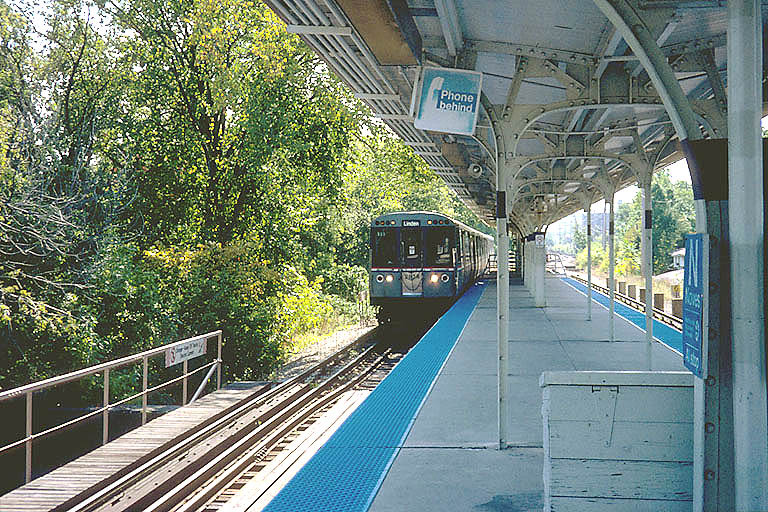 The older KDR-type station name signs were replaced with new Green Line Graphic Standard versions. The thinner strap brackets that held up the previous signs were replaced with more substantial steel frames. 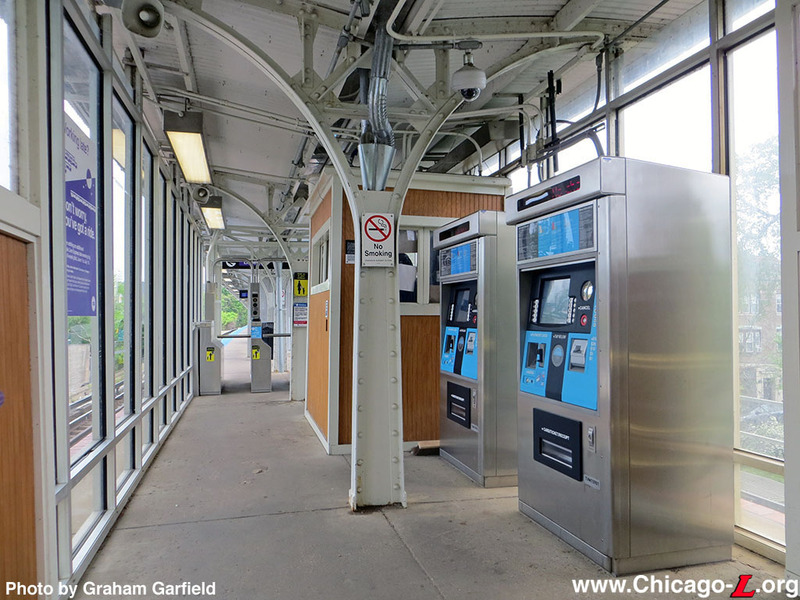 Also replaced were the directional wayfinding/Board Here signs, the long signs directing passengers to which direction of service operates on which side of the platform, at the top of each stair to the platform. The first of the new station name signs and a few symbol signs were installed at the far north end of the platform at the same time. 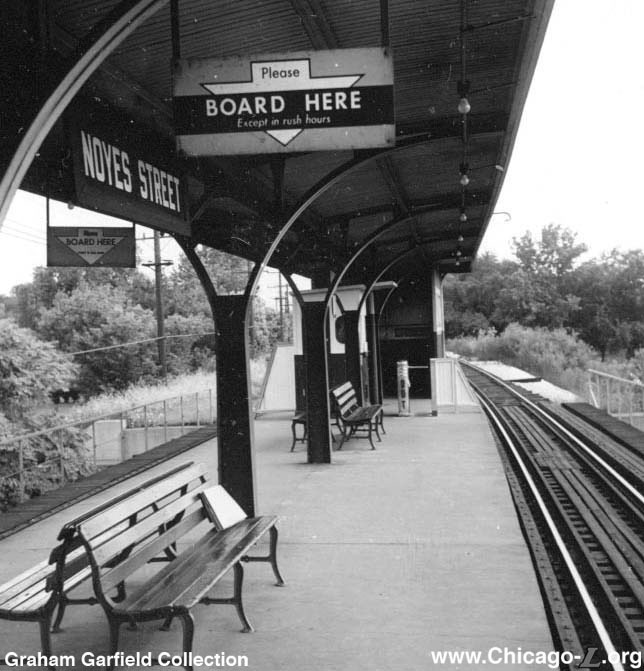 The rest of the station name signs, column signs, and directional signs were installed later. 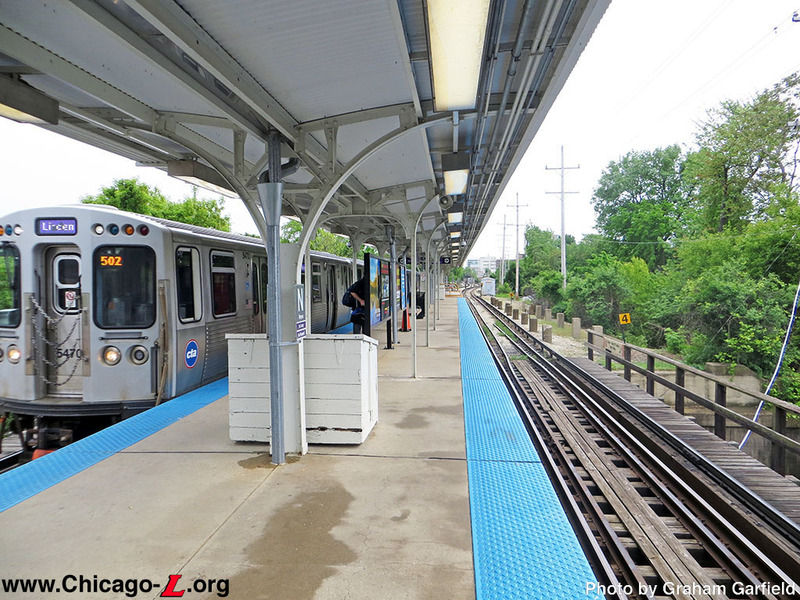 On September 20, 2011, Chicago Mayor Rahm Emanuel and CTA President Forrest Claypool announced a new CTA station renewal initiative designed to provide a facelift to 100 CTA rail stations over the following 12 months. The initiative, performed by work crews called the 'Renew Crew' comprised of different trade workers, focuses on providing repairs in a more efficient way, creating a cleaner, brighter and more appealing station that improves the customer travel experience. Different stations received different scopes of work depending on their needs and the available resources, but generally fell into two categories: basic renewals and expanded renewals. Noyes received an "expended renewal' in Fall 2012, and as part of the work crews rehabilitated several parts of the station over a six-week period. To accommodate some extensive work at the entranceway and stairs, which are narrow and for which there is no alternative for platform access, the station was temporarily closed over the weekend of October 12-15, 2012. Improvements at Noyes included paint removal and reapplication, power washing, gutter and drain cleaning, graffiti removal and lighting additions. 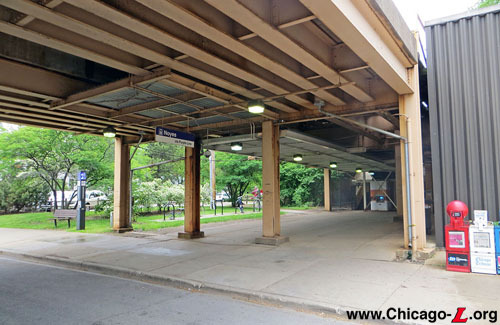 Specific upgrades included bolstering the platform canopy structure, replacing rotted wood at the base of the customer assistant booth, replacing wooden windbreaks with steel ones, adding a bench, patching loose concrete on the platform, and clearing abandoned bikes and bike frames from racks at the street level. The steel canopy structure was primed and painted, including the columns and arched roof supports, and base plates. The canopy roofing, which was originally wood beadboard covered with asphalt roofing paper and tar, was replaced with a new corrugated metal roof. Deteriorated sections of corrugated metal roofing underneath elevated track structure were replaced, and paint touched up on the roofing. 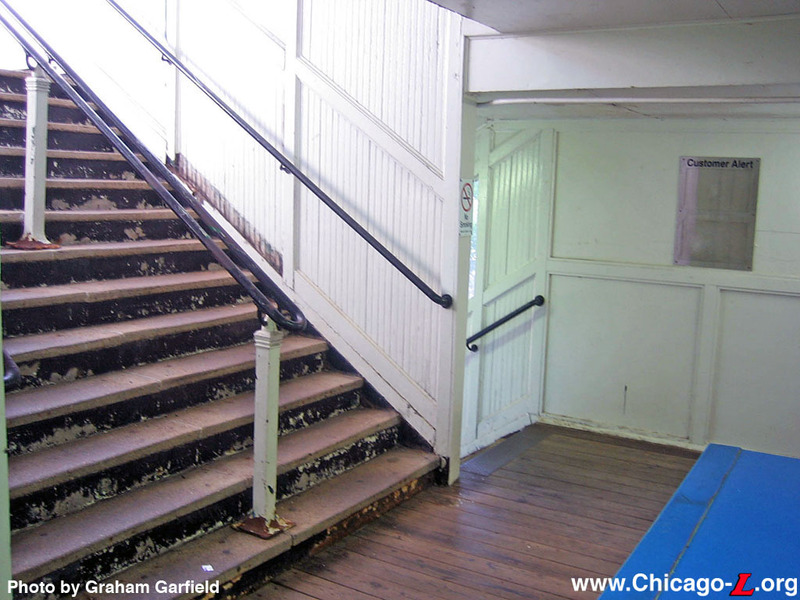 The wooden enclosure around the stairs from street level to the platform was replaced with new wood beadboard, left unpainted, and damaged lexan windows replaced. Long-covered windows were reopened, and wood cladding added to the rear wall of the stairs, which is actually the beginning of the concrete embankment. Lighting fixtures were relamped and cleaned. 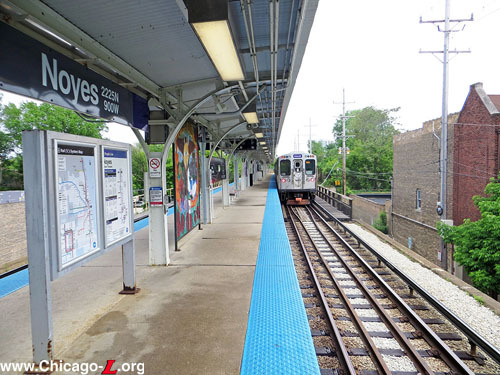 The Modernization with Station Consolidation option includes the consolidation of Foster station with the Davis and Noyes stations by closing the existing Foster station and adding entrances to Davis and Noyes -- at Church Street for Davis station, at the north end of Davis station and approximately five blocks south of Foster station; and at Gaffield Place, approximately three blocks north of Foster station and one block south of Noyes station. 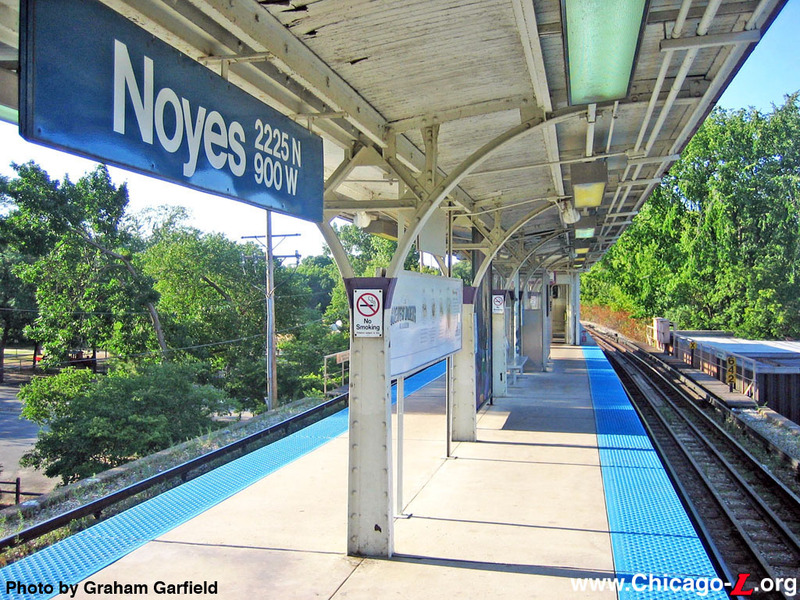 The Modernization option, while including no station consolidations, also includes the addition of an auxiliary entrance to Noyes station at Gaffield Place.